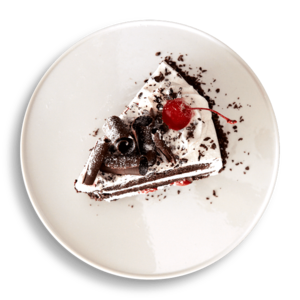 Klingler’s Black Forest torte has been on the menu since the restaurant opened in 1987. A traditional German dessert, the Black Forest cake — or Schwarzwälder Kirschtorte — is named not for the Black Forest mountain range located in the country's southwest region, but for a popular specialty liquor of the area, known as Schwarzwälder Kirschwasser. Distilled from tart cherries, the liquor is traditionally what gives the cake its distinct flavor. In Germany, it is illegal to market a cake as Schwarzwälder Kirschtorte if it doesn't contain the liquor as an ingredient. Klingler's Black Forest torte sticks close to tradition, consisting of four layers of moist, dark chocolate cake soaked in cherry liquor and topped with fresh whipped cream, chocolate shavings and more cherries. Available as a whole cake or by the slice, the dessert is consistently named one of the area's best dishes in local polls.